As part of an exciting project of re-furbishing the outdoor field at East Northumberland Secondary School in Brighton, Ontario, a new Nevco Multi-Sport Scoreboard was installed this fall. 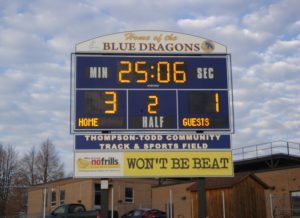 The Model 3625-ETN is a professional-looking 18′ x 9′ scoreboard with large 30″ and 24″ digits and Electronic Team Names. The addition of an arched sign on top of the scoreboard for school identification, as well as signs below for the name of the field and sponsor, make this a focal-point for the school and surrounding community. Go Blue Dragons!